RSCDS Sacramento demo team warming up for practice. We will be dancing at the Festival of trees at Micke Grove. .…for the Pleasenton Games adjudication set. We danced Saturday at the Oregon Shakespeare Festival in Ashland. 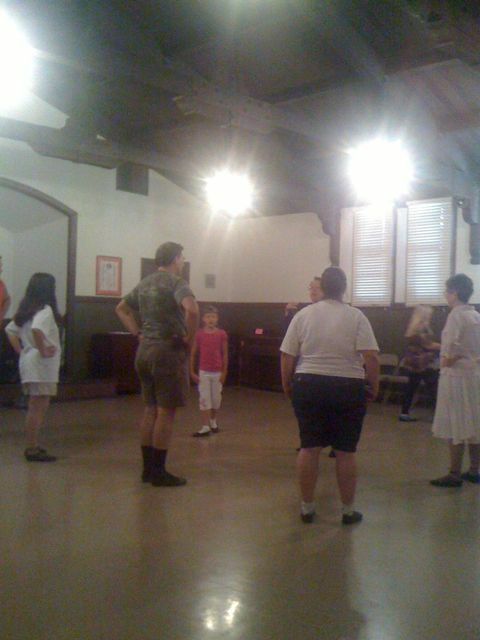 We had a group of 15 dancers, ranging in age from 10 to mind-your-own-business, and in experience from a few months to we’ve-stopped-counting. We arrived in Ashland on or before Friday; some of us took the opportunity to get there early and see a few plays. The Festival provided housing for Friday and Saturday night. 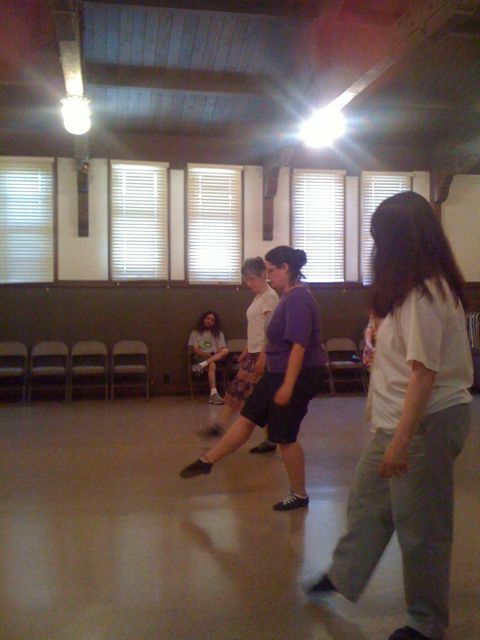 We met Saturday morning for walk-throughs on the stage, and then were free to enjoy Ashland until evening. Sound check was at 5:15, cast call at 6:15 and the performance from 7:15-7:55, letting us finish in time to make an 8:30 play. The weather was warm, getting up close to 100 in the middle of the afternoon. but threatening thundershowers cooled things off nicely at performance time. Fortunately the showers themselves held off until just after we danced. We had a couple of minor glitches, but that is normal and expected, and overall the performance went very well. Everyone was very enthusiastic and complementary. After we danced about half the group used our comp tickets to see Equivocation, the only play available for comps that evening. It was the only choice available, but it was an excellent choice. It is a play I would love to see again, if done as well as it was done in Ashland. It is a brilliant play. Some of us then partied into the wee hours, and dragged ourselves home Sunday. Others had the good sense to get to bed a bit earlier, and then dragged themselves home Sunday. It was a wonderful weekend, and a number of us are plotting return trips in future years, even if we don’t get to dance. 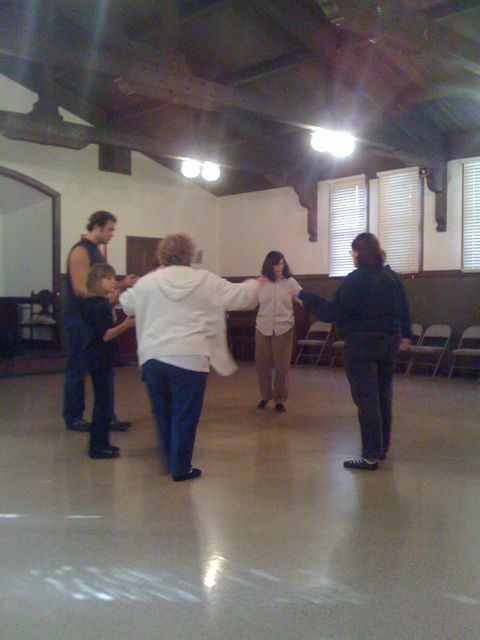 EB, Lynne, and Carol practicing the ladies step dance “Yellow-Haired Laddie” for our Ashland Oregon Shakespeare Festival performance. Demonstration team members getting ready for practice Saturday July 11, 2009.